For this post, I have put together a collection of the best whole house water filters currently available. 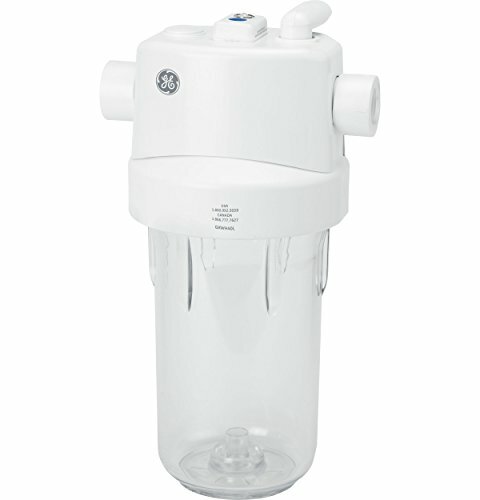 Standard “point-of-use filters” such as water jugs and tap purifiers offer the ability to filter the water where you need it. However, these methods are time consuming and are only effective if installed on every fixture of your house. A more efficient technique is a “whole house” filter system. Whole house filters differ from a point-of-use-filter by being located at the source of your home. The filter is installed at a junction before it reaches your individual water fixtures. This allows for all of your taps, showers, washing machine, etc. to distribute filtered water. Physical contaminants: sediment or organic material suspended in the water of lakes, rivers and streams from soil erosion. Chemical contaminants: naturally occurring or man-made. Examples: nitrogen, bleach, salts, pesticides, metals, toxins produced by bacteria, and human or animal drugs. Biological contaminants: organisms in water. Examples: bacteria, viruses, protozoan, and parasites. Radiological contaminants: chemical elements. Examples: cesium, plutonium and uranium. Source: “Types of Drinking Water Contaminants” United States Environmental Protection Agency, www.epa.gov/ccl/types-drinking-water-contaminants. Flow rate - gallons per minute (GPM). Standard requirements will vary from 15 - 40 GPM depending on your total fixture counts and individual flow rates. 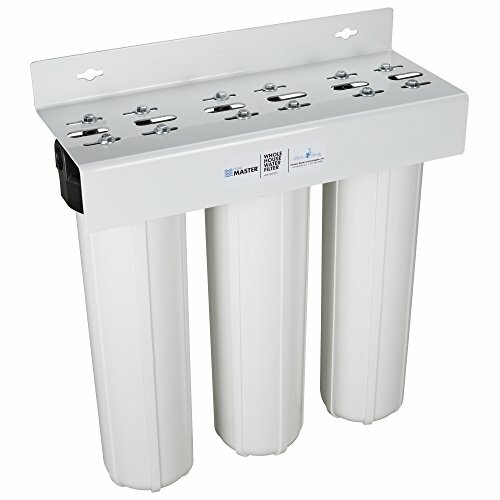 Filter life - replacement cycle based on the filter type, level of water contaminants and flow rates. Port size - connection point diameter. Minimum ideal port size is 1" to avoid pressure drops. Source: “Advanced Whole House Water Filtration Buying Guide” Advanced Water Filters, www.advancedwaterfilters.com/buying-guide-whole-house-water-filtration/. The following whole house water filters use the latest innovative components to meet your needs. So here is my list of The Best Whole House Water Filters. 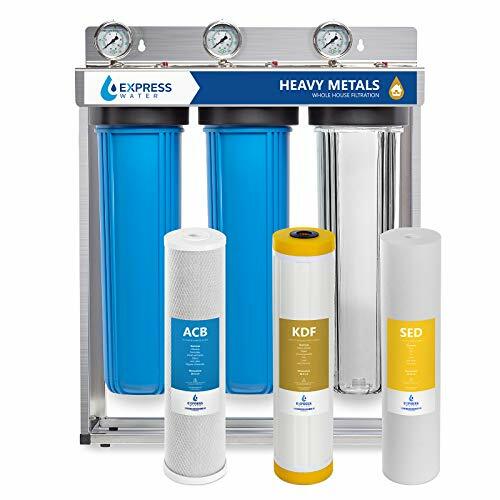 The Express Water WH300SCKS Whole House Water Filter features a comprehensive three stage system with pressure gauges for easy monitoring. Stage 1: Sediment filter prevents coarse damaging contaminants like sand, rust, and dirt. Stage 2: Kinetic Degradation Fluxion filter (KDF) captures heavy metal contaminants. Stage 3: Activated Carbon Block (ACB) captures chlorine, total organic carbon (TOC), pharmaceuticals, pesticides, turbidity, and chemicals causing bad tastes and odors. First filter housing is translucent so you can see when the filter needs to be replaced. Each set of filters lasts for up to 100,000 gallons or 6-12 months of use on average. Simple twist-off housings and drop-and-go filter design for quick replacement. Each housing connected with industrial bonded high capacity flow connectors. Every connection is rated for up to 0.25 gallons per second (15 GPM) at 45-80 psi. Standard 1” connections for easy adaptability and high flow. 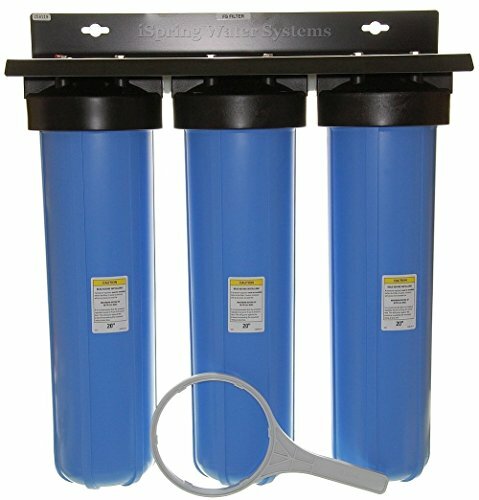 The iSpring WKB32B Whole House Water Filter features a three state 5-micron filtration system. Stage 1: 5-micron high-capacity polypropylene sediment filter. removes dirt and other various larger sized particles from the water that can clog the following filters. Stages 2 & 3: 5-micron CTO coconut shell carbon block filters. Block carbon filters have a higher density than other types of carbon filters, and are more effective in removing the targeted contaminants. Carbon block filters remove bad tastes and odors. Effective for chlorine, organic chemicals (VOCs) like pesticides, herbicides, and industrial chemicals. 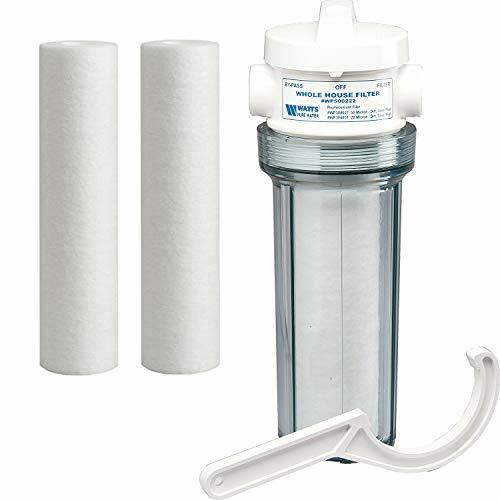 The Home Master HMF3SDGFEC Whole House Water Filter three stage system delivers clean, clear water to every faucet and bath in your home without drawing down water pressure. .
Four separate filter layers for enhanced filter performance. Typical life cycle 6, 12 months depending on usage and sediment quantity. Radial flow iron, manganese and sulfur reduction. Radial Flow design provides excellent iron reduction with minimal pressure drop (<1 psi pressure drop). Reduces possibility of pipe and water heater damage. Radial flow granular activated coconut shell carbon. Highest grade coconut shell carbon for maximum chemical contaminant removal. Chlorine, taste, chemical, and odor removal. Ideal for well water with sulfur, manganese, and iron up to 3 ppm combined contaminant load. Large filters require less frequent service. 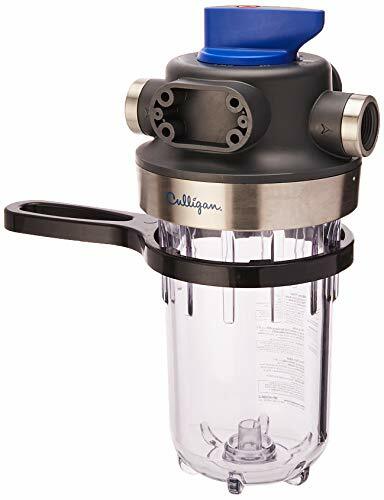 The Culligan WH-HD200-C Whole House Water Filter limits the amount of dirt and grime introduced into your appliances. Works to reduce dirt, sand, and silt buildup in plumbing lines to benefit you and your fixtures. 1" inlet / outlet for water flow. Pressure Range: 30 - 100 PSI. 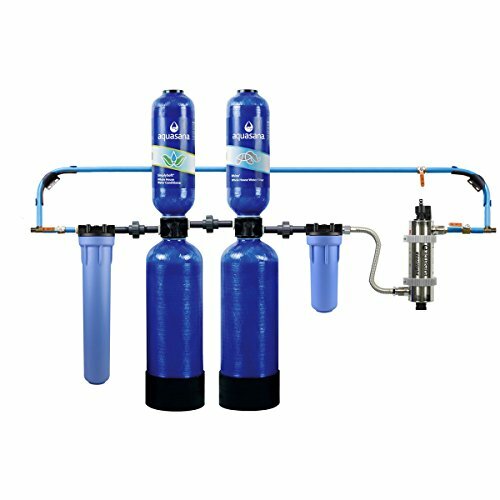 The Aquasana 10-Year, 1,000,000 Gallon Whole House Water Filter features UV Sterilight Filtration that removes 99.99% of viruses and bacteria such as e-coli. UV filtration gives an added safeguard against those bacteria or viruses that may be present in your water. Effective scale prevention for the entire house without the use of chemicals or salt. 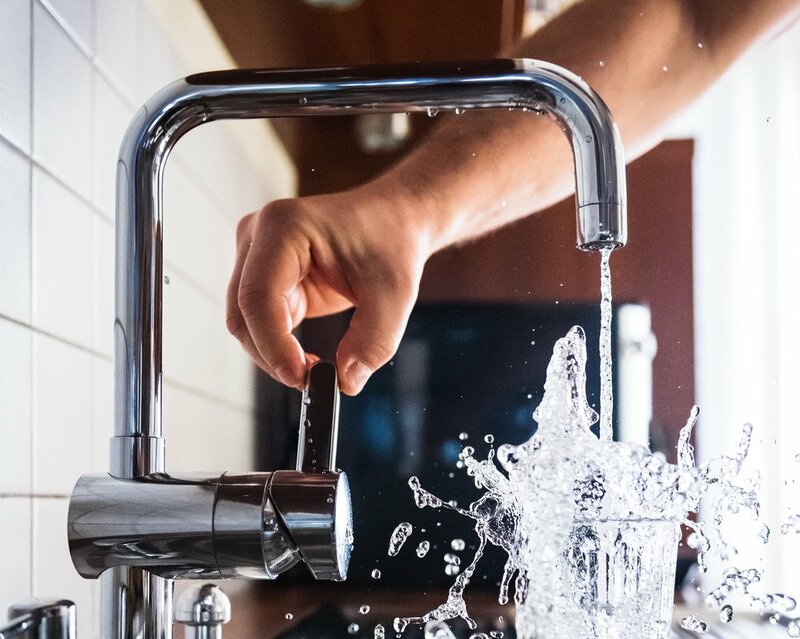 Simply Soft SCM technology will not demineralize your water nor will it negatively affect the environment by adding excessive amounts of sodium into the communal water system. Ideal for anyone on a well-water system or for anyone worried about boil warnings. Protect appliances and plumbing by reducing the adverse effects of excess iron and scale. The GE GXWH40L Whole House Water Filter reduces sand, sediment and rust from your main water supply. Premium filtration certified to reduce sediment, scale, dirt and rust in your water, appliances and plumbing fixtures. High-flow system with a 40 psi - 100 psi feed water-pressure tolerance. Clear sump allows easy monitoring of the filter. Bypass valve helps increase filter life when filtered water is not required. Canister wrench is included for easy filter changes. The iSpring WGB21B Whole House Water Filter is highly effective on organic chemicals (VOCs) such as herbicides, pesticides, and industrial chemicals. 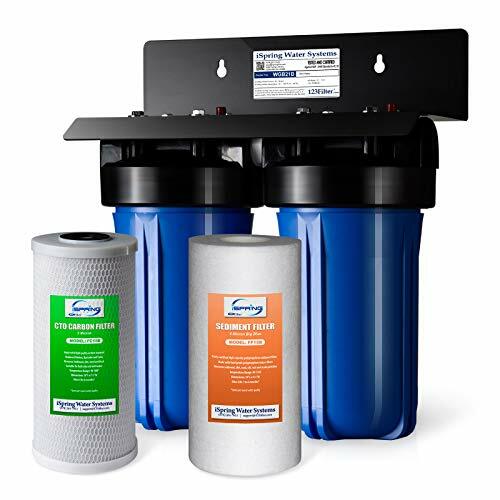 Stage 1: 5-micron high-capacity polypropylene sediment filter removes dirt, rust, and most suspended solids, to protect and extend the life of the CTO carbon block filter. Stage 2: 5-micron CTO coconut shell carbon block filter. Compact design is designed for smaller homes or where limited space may be a concern. Filter provides up to 50,000 gallons of filtered water. Carbon block filter takes out bad tastes and odors. Removes over 90% of sediment and chlorine from the water. 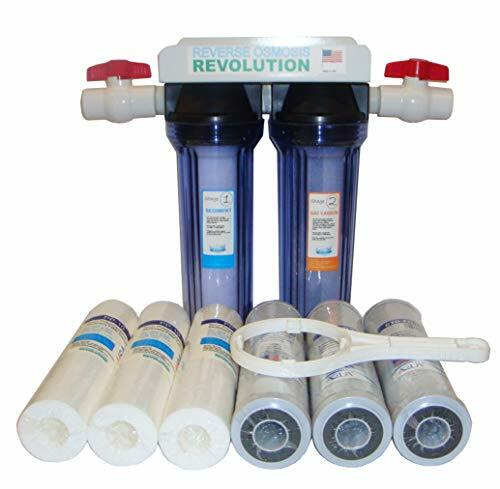 The Reverse Osmosis Revolution Whole House Water Filter features a two stage system. Stage 1: Premium Quick-Connect 5 micron sediment filter. Dust, dirt, silt, sand, rust and scale particles are trapped here in a filter to also extend the system life. Stage 2: Premium 5 Micron High Dirt Capacity CTO Block Filter (10"x2.5"). Reduction of bad taste and odor, chlorine, chloramine, VOCs, sand and dirt removal. Whole House System easily attaches to house plumbing. Filtration system comes with regular 10" housing. 3/4" port with 20 to 80 PSI water pressure. 100 ~ 40 deg. F (37 ~ 4 deg. C) working temperature. Flow Rate / GPM 1 - 10 GPM for 3/4" In / Out. Note this is a relatively low flow rate, check your required GPM. 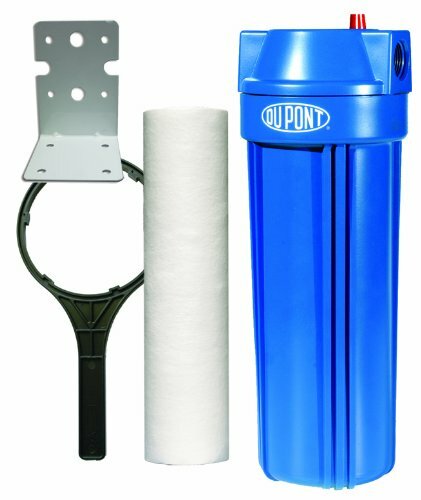 The DuPont WFPF13003B Whole House Water Filter features standard capacity sediment filtration. Easily upgraded to higher performing Pre-Filter cartridges. Helps to extend the life of household fixtures that use or process water. Standard System has 3/4 in. inlets and outlets. Includes: universal 500 series poly block cartridge, filter head and housing, mounting bracket, hardware and tank wrench. The Watts WH-LD Premier Whole House Water Filter provides cleaner water while protecting your water appliances from the build-up of dirt, rust and sediments. Equipped with a built in bypass valve for convenient access when making filter changes. Helpful for well water supply and/or water with rust and dirt particles. 3/4” ports fits standard household plumbing. Equipped with 50 micron sediment filter, ball valve, and wrench. I hope this list of the best whole house water filters was helpful.